The verse defines that Prophet Muhammad is the last Prophet, and also that he was ranked as the divine seal acknowledging and certifying the previous Prophets, and that prophethood had come to an end. The development of humanism, in terms of religion, reached a climax and religion reached perfection with Prophet Muhammad. (Al-Ma’idah 5:3) There was to be no Prophet or Messenger after Prophet Muhammad. So whoever claims to be a Prophet, Messenger or Warner would be a liar and therefore would have claimed false prophecy. These verses of the Qur’an affirm the universality of Prophet Muhammad’s prophethood. 3- Prophet Muhammad is a bearer of glad tidings and a warner. 4-The Prophet Muhammad is the Most Excellent Model. This verse mentioning Prophet Muhammad (saw) as an example first for all Muslims in general, and then particularly for those who bear hope in Allah and the Last Day, is in fact aimed at defining the qualities of those to whom the Prophet will be an example. Prophet Muhammad is an example of excellence to the believers in his faith, worship, morality, in his words and every action. As in the case of all the previous Prophets, being a hadi (guide) as mentioned in the Qur’an, was also an attribute of Prophet Muhammad. The fact that the Prophet was a guide to the path of truth is clearly stated in the Qur’an. This verse is one of the examples: “And indeed, (O Muhammad), you guide to a straight path.” (Ash-Shuraa 42:52) The Prophets guidance consists of teaching people the path of righteousness, indeed Allah is the One who bestows guidance. As a result, Prophet Muhammad (saw); was sent as a Messenger to the whole of humanity, and he is the last of the Prophets. Prophet-hood came to an end with Prophet Muhammad (saw). He is bearer of glad tidings, a warner, an advisor caller to the truth, a guide, a Prophet of tenderness and mercy. 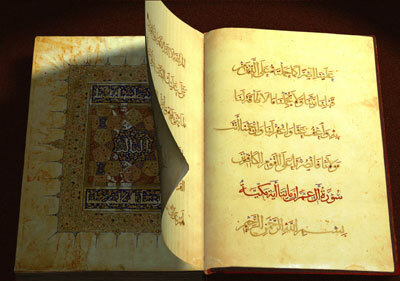 He practiced the commands, rulings and prohibitions of the Qur’an in every aspect of his life. In his speech, behavior and essence, he was the most excellent example to the whole of humanity. He was a Prophet of love, affection and compassion, not of hatred and harshness. Prophet Muhammad fulfilled his duty towards his followers in the most excellent manner. And the duty of his followers is to bear witness to his prophecy, obey his teachings, love him and embed this love into the hearts of others, and to practice and continue the religion he preached. Please type '580' into this field.